The World Affairs Council of Austin’s Center for Global Trade has established an MOU with J-GoodTech, a division of Japan’s Organization for Small & Medium Enterprises and Regional Innovation (SMRJ). The partnership is specially tailored to connect Texan companies to potential customers and partners in Japan. J-GoodTech is comprised of approximately 8,100 qualified Japanese SME members representing numerous industry sectors. These companies have operations in Taiwan, Thailand, Vietnam, Indonesia, and Japan. 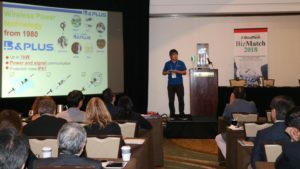 The inaugural event for the BizMatch platform (held on September 26, 2018) featured visiting representatives of 24 Japanese companies seeking Texan R&D, JVs, sales, purchasing, distribution, ODM, and other partners in the manufacture of: Semiconductor; Cleantech; Machinery; Computer & Electronic Components; Electrical Equipment & Appliances; Aeronautic and Automotive; Fabricated Metal Products; Medical Devices; Remanufactured Goods; and Food Packaging. Texas companies seeking to feature their products on the BizMatch online platform may complete the form located here.